In mid-spring the lilac rhododendrons in my garden seem to enjoy their special flowering season. This is 'their time'. By now the sunlight in my garden is strong (I'm not complaining), and shrubs with paler colours can look washed out, even in the shade. But then comes an overcast day - so beautiful! I'm a compulsive plant rescuer, and most of my rhododendrons started life in the same bargain bin at my local rhododendron nursery. Names and colours unknown, they were brought home and lovingly planted in different garden areas, in different years. It's therefore quite possible that I've acquired doubles of the same shrub. They're not all the same, though. I can tell more by the initial colour of the buds. Honestly! 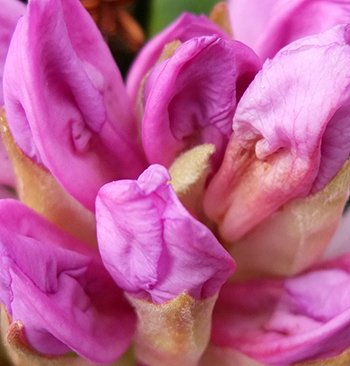 The unopened flower buds are darker and richer than the open flowers, all blending into an overall 'lilac' impression. But on closer flower inspection I can see subtle colour highlights - tiny freckles of terracotta, dark brown, or maroon. 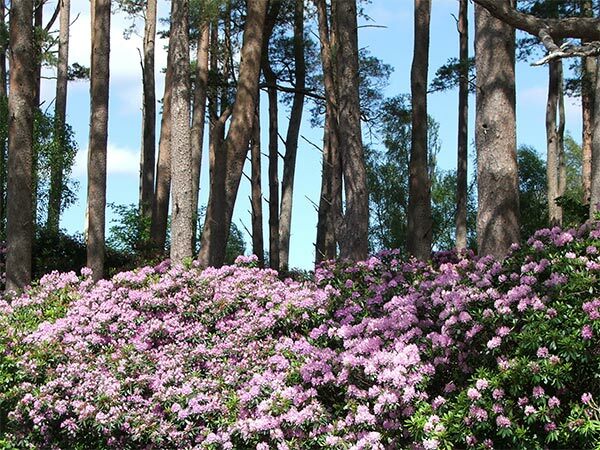 Rhododendron ponticum is the species lilac, and has severely colonised parts of Britain. I took the above photograph while garden touring in Scotland. 'Enjoy' may not be the word for the local gardeners!